Are you thinking of upgrading your old fuse box or consumer unit? – Residual Current Protection Devices (RCD’s) which can save lives, prevent fire and comply with the requirements of the current Wiring Regulations – 17th Edition). – Made from inflammable material, helping prevent serious electrical fires. 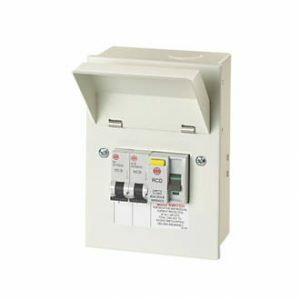 – Modern Circuit Breakers – fast disconnection times, easier maintenance & more user friendly. Before your fuse box is upgraded or consumer unit changed, we will visit your property to survey the current electrical installation to ascertain what size board you require as well as check the basic condition of your electrics to make sure it is safe to proceed. If any urgent remedial work is required before your consumer unit can be installed this will need to be completed before we can start. 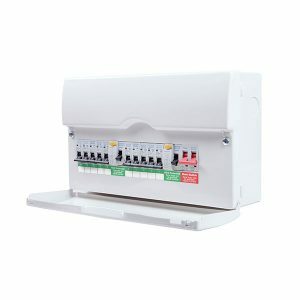 It normally takes a full day to install your new consumer unit, including full inspection and testing of the circuits being connected to the new board. Made from flammable material that can cause a serious household fire. Upon completion of the installation of your consumer unit we will provide you with an Electrical Installation Certificate as well as notifying Building Control of the work. 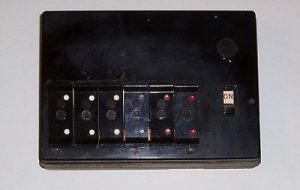 Old fuse boxes can be dangerous and should be inspected to determine their safety and suitability. Upgrade & Installation of Garage / Outbuilding Consumer Units. The correct installation of Garage Consumer Units requires a qualified electrician, contact us to discuss your requirements and be safe in the knowledge that your installation will be safe, suitable and certified.